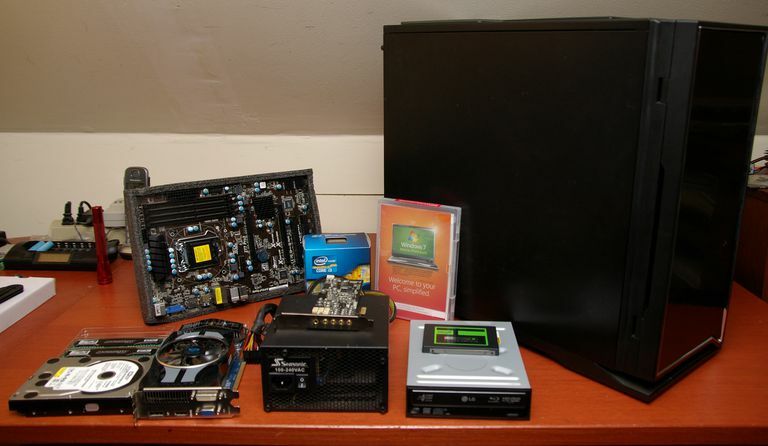 Before embarking on building your first computer system, it's important to make sure that you've obtained all of the necessary parts to make a functional home desktop computer. Below is a list of the key components that will be necessary for making a complete system. Some items aren't mentioned, such as internal cables, because they're generally included with other parts like the motherboard or hard drive. Similarly, although peripherals like a mouse, keyboard, and monitor are not listed, it's important to make sure you have them. Case This is what holds the whole system together. All the other parts of the computer will reside within it. The choice of a case size may impact what other components will be able to fit inside of it. This is also the visible portion of the system, so selection should be based on functionality and aesthetics. Power Supply Some computer cases will come with a power supply pre-installed, but many do not. As a result, it's necessary to get a power supply that works with your components and has sufficient power. Newer features such as modular cabling and efficiency ratings are also something to consider. Motherboard The motherboard is the backbone of the system. It determines the type of components that can be used with the system and the number of internal peripherals the computer can support. It will directly impact the processor used and total amount of memory that can be supported. Processor The CPU is the brain of the computer system. This will be the primary factor in how fast the system is. Ironically, performance has gotten so good that many people don't need a very expensive processor for what they use their computer for. Heatsink If the processor was purchased via the retail packaging, it will include the manufacturer heatsink. However, for those who purchased an OEM or specialized processor, it will also be necessary to have a CPU cooler. Without it, your CPU will quickly burn itself out. Make sure that any heatsink you use is designed for the socket, is properly rated for the thermal output of the processor, and will fit inside of your case. It's also possible to use a liquid cooling system in place of a fan and heatsink. Memory Without memory, the computer will not be able to function. The CPU needs it to store the code to tell it how to properly process data. You'll need to know the type of RAM your motherboard uses and how much you need. Memory directly impacts performance. Hard Drive The primary method of storage in all desktop computer systems is a hard drive. Typically, it will be a 3.5" hard drive. Some performance users may consider using solid state drive either for primary storage or for caching. DVD or Blu-ray Drive (Optional) Optical drives are not the requirement they once were. You can even get Windows on a USB drive for installation. You really only need one if you plan on using the system to play back CD, DVD, or Blu-ray discs. Video Card (Optional) Pretty much every desktop processor features an integrated graphics processor. This makes video cards more specialized than they were in the past. You'll use one of these if you're planning on playing 3D games or will be accelerating non-3D programs like Photoshop or video encoding. Sound Card (Optional) Most motherboards feature some form of a built-in sound controller. As a result, sound cards are not required unless you want higher fidelity computer audio or less reliance on the CPU to assist with the computer audio. Some devices are not important in the initial build process but can be useful later. Flash drives, external hard drives, and external floppy disk drives are a few examples. You can install them at any time, and even completely remove them forever should you choose to since they don't represent an essential PC component. While the above is a focus on the hardware of the desktop PC system, it's equally important that the computer has an operating system so that you can actually use the new computer. Windows and Linux are a couple options. Once you've installed the operating system, there are other things you should do before considering your new computer "complete." Why Would You Even Consider Buying a Desktop PC Today?